I recently got a job at a cafeteria that is so incredibly understaffed that during my first 2 weeks of work I have managed to get over 10 hours of over time. It's been crazy, and to top it off, some of the people who do work there.... don't even work, so it's really more short-staffed than it needs to be. Fun stuff. And it's sooooo bizarre for me. 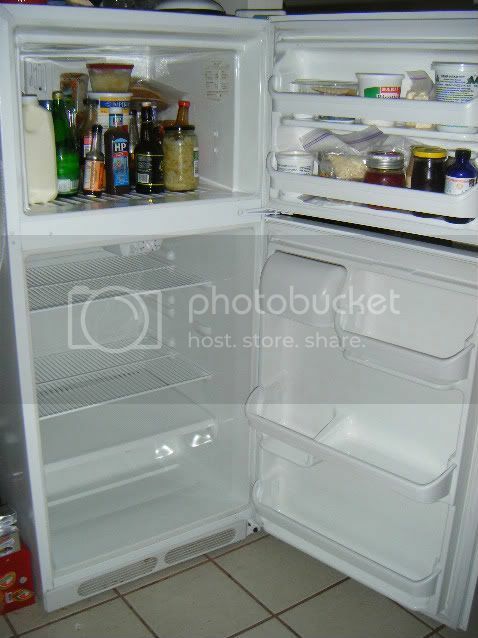 I just find it so strange to look in there and see so much food and nothing that I want to eat. Like... Nothing. Oh and I ate a piece of fruit from out of there yesterday and it was so cold on my teeth. Yucky. I finished work for the summer, and it kinda feels like winning the lottery! WOOHOO!!! All I know is that I want to learn more about chocolate. I love it, it's what I really want to do with my life. So we will see how that goes, hopefully I can just find a job with one of the other chocolate shops in Edmonton for now, but I would LOVE LOVE LOOOOVVVEEE to go and work in say... Belgium. :) but who wouldn't? The only thing I don't like about it, is that I'm out of town for it. Which means I won't get to see Rene as much. Which makes me sad. This is what it looked like when I did it. I LOVE not drinking ice cold water. Mmmm. So much better. Probably not because that would just be stupid. But if all my friends were turning off their fridges, would I feel inspiered and try to follow suit? Probably... yes. Rene was initially very very against it, saying that I was trying to change his life. Which I thought was a little bit over dramatic, I HATE cold water anyways, we only keep our beverages cold because of him, and he doesn't even drink that much water anyways. I think I might have found a solution though, we are going to try to turn off the fridge, and use the frezer portion of our fridge as a cooler, for now. I've said that if it isn't working, we can turn it back on. Who know's maybe this will fail miserably, maybe it will free us just a little bit more. So I'm basically done school now, I'm just doing some work experience, then we have a graduation ceremony next friday, then it's over. But apparently, I have been using it WRONG for those 2 years. I found a post on a blog that I lost the link to last week, and OH MY GOODNESS! Neti pots actually work! I got some of the biggest boogers out of my nose the other morning, I could breath! It was possibly the best morning I've had it a long time. I'm still sick by the way, I think it's a sinus infection, but it's dying off slowly. That I was really really sick. So sick that the doctors wanted me to stay at the hospital and get numerous saline IVs because I was dehydrated. But well enough that when my dad demanded he was taking me home, they said okay, but made him promise to bring me back for a billion more blood tests. So that means that it was almost a year ago that I discouvered the wonderful Nourishing traditions, and became somewhat obsessed. So in a way, I'm so very happy I was so sick a year ago, because if I hadn't been I wouldn't have stayed home from work and looked at a million blogs speaking praises to the book. The reason I'm thinking about this is because, I'm sick right now(I have a terrible immune system). I should be sleeping, and I am tired, but I just don't want to be asleep right now. So I'm biding my time by writing a post on my phone. :) Then I will go to bed. Anyways, thank you to all the wonderful people who's blogs have so inspired me over the past year to be a better, healthier person. Really, thank you. 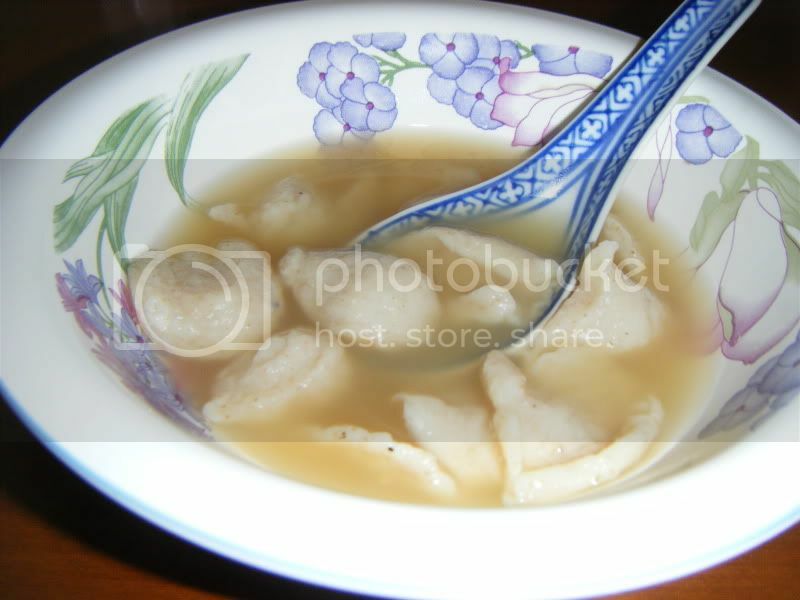 Not like the Chinese or Japanese dumplings you might be thinking of, I'm talking about European soup style dumplings. They are so SO easy to make. Super cheap, I'd be willing to say that you have EVERYTHING you need to make them in your home right now. You can make them in a matter of minutes. Here's what you do. Then, get a bowl, mix 1 cup of flour(Sprouted would be best), 2 teaspoons Baking power, and 1/2 a teaspoon of salt. Break an egg into a 1 cup measuring cup and fill the rest of the way with milk, mix into the flour mixture, if it's so dry you can't even mix it add a little more milk, if it's too wet add more flour, you want this to be as stiff as possible for the best dumplings. Now all you have to do is throw little spoonfuls of the dough into the simmering water, making sure not to crowd the pot, put the lid on and simmer for about 10 minutes. You are done, easy stuff right? These taste best when eaten right after they are made. The best part about this recipe is that it is SO diverse, you can add whatever you want to the dumplings for flavor(Think cheese, or green onions) if you add your extras before you add the liquids it will incorporate easier. You could use gravy instead of stock for a heartier meal. And the stock doesn't have to be plain, throw some meat and veggies in there, now you've got a real soup, and it didn't take that long did it? As a side note, the ones in the picture I made by putting the dough in a ziploc bag and squeezing out the dough, snipping off little gobs at a time. When you make them by spooning them out they look so much more rustic!